The 125th Statehood Anniversary Wagon Train is an opportunity to participate in and learn about South Dakota history. The wagon train will begin at the Dakota Territorial capital of Yankton on Wednesday, Sept. 3 and will arrive at the South Dakota capital of Pierre on Saturday, Sept. 20. At each evening stop along the approximately 250-mile trip, local landowners and historians will present a history of that local area. Community and civic groups will be sponsoring many of the evening meals and events, so people can see the wagon train up close and visit with wagon train participants. The wagon train is sponsored by the South Dakota Draft Horse and Mule Association. The route of the wagon train route is intended to commemorate historic trails. The route from Yankton to Mitchell will be near what was called the Fort James Trail, according to wagon master Gerald Kessler of Fort Pierre. Listed on the National Register of Historic Sites, Fort James was located near what is now Mitchell. The fort was probably named for the nearby James River. It was one of a series of forts built to protect settlers after the Dakota War of 1862, according to the television show “Time Team America,” in which a group of archaeologists spent three days excavating the Fort James site. The fort was built in 1865 by the 6th Iowa Volunteer Cavalry. The men signed up to help fight in the Civil War, but instead found themselves sent to the western frontier. What makes Fort James unique was that it was built of stone. Fort James is believed to be the only military post in the United States built entirely of stone. A natural outcropping of quartzite granite was located nearby. Fort James was decommissioned after 11 months and burned to the ground in 1868. When Firesteel came into existence in 1874, the Fort James Trail was extended to that community in Davison County. From Firesteel, trails would have followed Firesteel Creek much of the way to Fort Thompson and then continued on from Fort Thompson to Fort Pierre, or followed a more direct overland route to Fort Pierre, according Kessler. The trails would have been used primarily for hauling freight until white people started settling the area, Kessler said, with oxen used to haul the freight wagons. 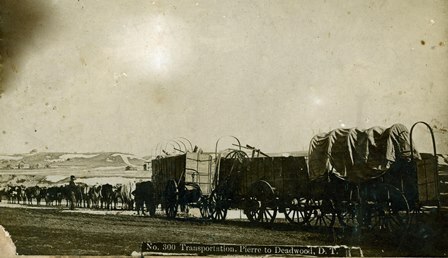 According to “Fort Pierre-Deadwood Trail: Then & Now” by James D. Osburn, Ken R. Stewart and Lonis R. Wendt, a freight team usually consisted of seven or eight yoke of oxen hitched to an old Murphy or Kern wagon. The load carried in the wagons generally weighed from 7,500 to 8,000 pounds. The freight wagons were sturdy, wide-tracked, double-boxed vehicles with heavy iron tires and heavy canvas covers. The 17-day trip includes 15 days of travel and two days of rest. After camping overnight in Yankton on Wednesday, Sept. 3, the 125th anniversary wagon train will leave Yankton on Thursday, Sept. 4. The route will pass within about 10 miles of Fort James, but will not stop there. Overnight stops are scheduled for Tabor, Scotland, Tripp and Ethan, Mitchell, Plankinton, Wessington Springs, Crow Lake, Gann Valley, the Allen Knippling ranch, near Mac’s Corner and by Krull Lodge. The wagon train will camp at Farm Island Recreation Area near Pierre on Friday, Sept. 19 and is scheduled to arrive at the Capitol building in Pierre at noon on Saturday, Sept. 20. For the first part of the wagon train, the route will be mostly on township and county roads, in road ditches and along undeveloped section lines. Once the wagon train reaches the Wessington Springs area, participants will travel cross-country or in road ditches near S.D. Highway 34. Kessler said he anticipates that more than 200 people will participate when the wagon train leaves Yankton. About 120 people from eight states have signed up to be take part in the ride. They are allowed to participate in any or all of the trail segments, so Kessler expects the number participating will vary throughout the ride. This moment in South Dakota history is provided by the South Dakota Historical Society Foundation, the nonprofit fundraising partner of the South Dakota State Historical Society. Find us on the web at www.sdhsf.org. Contact us at info@sdhsf.org to submit a story idea.